Shareholder advisory firms are recommending that Democratic billionaire Warren Buffett's Berkshire Hathaway start disclosing its political spending to the public, according to a Fox Business report. The two advisory firms, Glass Lewis & Co. and Institutional Shareholder Services, say the firm's current disclosure practices are insufficient and that it is unclear if its board of directors is even overseeing political spending. 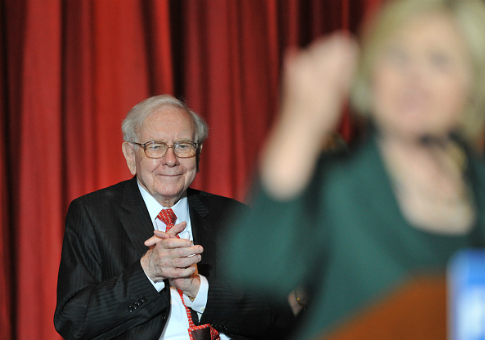 "Berkshire Hathaway—the parent company—has never made a contribution to any presidential candidate (nor any other political candidate) during my 52 years as CEO," Buffett told Fox Business. "I am sure that some of our subsidiaries—in particular those in heavily regulated industries—make political contributions and employ lobbyists." The call for greater transparency at Berkshire Hathaway comes a year after the company was federally investigated for predatory lending practices that targeted minority borrowers. Buffett controls 32.7 percent of voting shares at Berkshire Hathaway, so the call for increased political transparency is unlikely to pass at this weekend's annual board meeting in Nebraska unless he has a change of heart. Buffett said supporters of the push for more disclosure "will be given a reasonable amount of time to state their case." This entry was posted in Politics and tagged Democratic Party, Warren Buffett. Bookmark the permalink.